When Gaston Reyno talks about the 12,000 Facebook likes on a recent picture, or the 56,000 people who like his Facebook page, it’s hard to take him seriously, and with a modest 2-0-2 professional record in mixed martial arts, it’s easy to see why you might doubt his claims of popularity. However, a quick visit to his page makes it clear that the Uruguayan fighter descent isn’t lying. His daily social media interactions in English, Spanish and occasionally Portuguese have helped him become a sensation in his home country of Uruguay. Every one of his posts receives hundreds—if not thousands—of likes and comments. He’s also very active in his social media. You can find pictures of his father with many Uruguayan newspaper clippings about Reyno, or his thoughts on the Latin Grammys. However, this wasn’t supposed to be the life for Reyno. The country is home to 3.4 million people, most of whom live in rural communities. With four cows to every person, the population is comprised mostly of farm laborers, people who know hard labor. The Gaston family are from the city: Reyno’s dad is a trucker. His granddad is a trucker. His great granddad was a trucker. Gaston’s future was already set in motion. Reyno is the co-owner of Glory MMA and Fitness in Kansas City. After discovering Taekwondo at age seven, he continued his combat sports knowledge throughout his teen years, learning Muay-Thai and traveling to Brazil, Australia and Thailand, seeking to expand his skills. He watched mixed martial arts much the same way he watched the Ninja Turtles or Jean Claude Van Damme movies. To him, it was just something those crazy Americans were doing. When Reyno was invited to GrindHouse MMA in Kansas City by then owner Brian Davidson, he quickly fell in love with the place. It wasn’t an easy decision to leave his family behind, but he knew it was an opportunity he couldn’t pass up. He and UFC fighter James Krause now own Grindhouse MMA, which has been renamed to the aforementioned Glory MMA and Fitness. There’s a sense of nationalism in Reyno that no one from a country like the United States could quite comprehend. If our team doesn’t win in basketball, it’s okay because we have hockey or baseball or football to fall back on. The people of Uruguay don’t have that. They have soccer, they have the world cup, and that’s it. Reno is trying to change that. By traveling to the United States and competing successfully, he’s trying to show Uruguayan people that there are other opportunities. To hear Reyno describe the mixed martial arts scene in Uruguay sounds like something out of a sports fan’s nightmare. There’s no commission, no ringside doctors, no medical inspections. You could be knocked out the day before and compete the next day. Many of his early Muay-Thai bouts took place on a basketball court, with a square sectioned off by rope. Reyno tells an interesting story of the one and only professional mixed martial arts bout he fought in Uruguay. It took place at a hotel he described as one of the nicest in South America and it was broadcasted on national television. The event had a total of two pairs of gloves, which can be confirmed with a quick Youtube search, meaning that by the time Reyno made his way to the cage for the main event, his gloves had already been worn four times that night. He approached with hand wraps that weren’t checked before putting on worn out gloves. The scene is rapidly improving, and although Reyno won’t take credit for the sport’s rise in Uruguay, he’s unquestionably a driving factor in the sport’s growing popularity. He says that because of the messages and support he receives, he no longer dresses poorly. He gets his hair cut regularly, never swears or puts forth negative messages on social media. 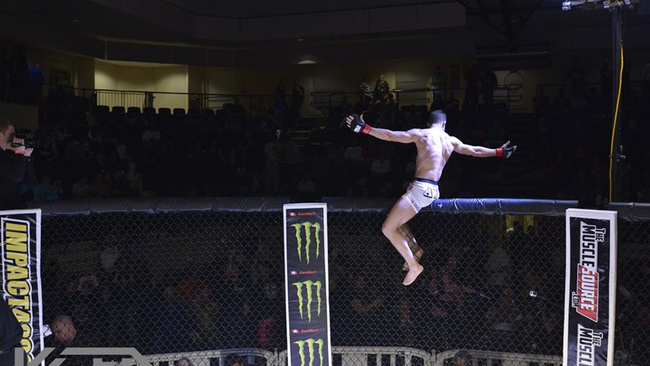 Reyno expects to be back in the cage in early 2015, and hopefully make it to the UFC with a few more victories. 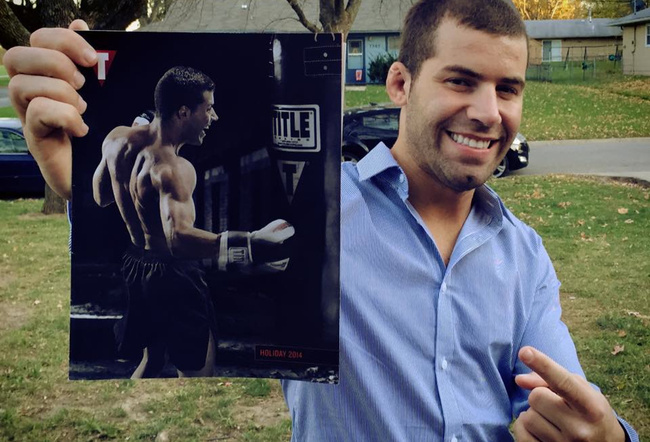 His dream is to headline a UFC event in Uruguay, but he’s well aware that the sport has a long way to go before that becomes a reality. For now, he’ll settle for fighting in the United States, and communicating with fellow Uruguayans by social media. He plans to continue bringing Uruguayan talent to his gym in Kansas City in the next few years, and says that being successful as a combat sports athlete has more to do with the mental abilities than technical skills. Although hesitant to name fighters, he says a trip home for Christmas will see him try to recruit heavyweight striker Ignacio Eirale to make the trek north with him.